Kolosej Maribor – decorative membrane façade. 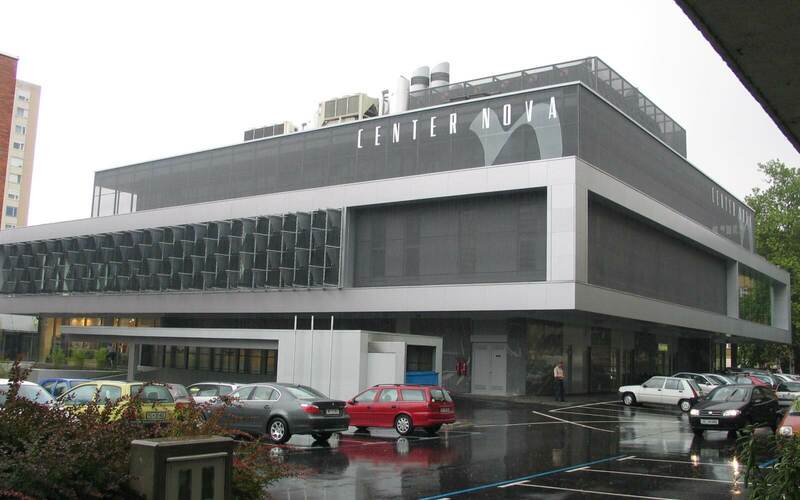 Hall 12 – perforated membrane façade with 3D elements on the shopping centre BTC Ljubljana. 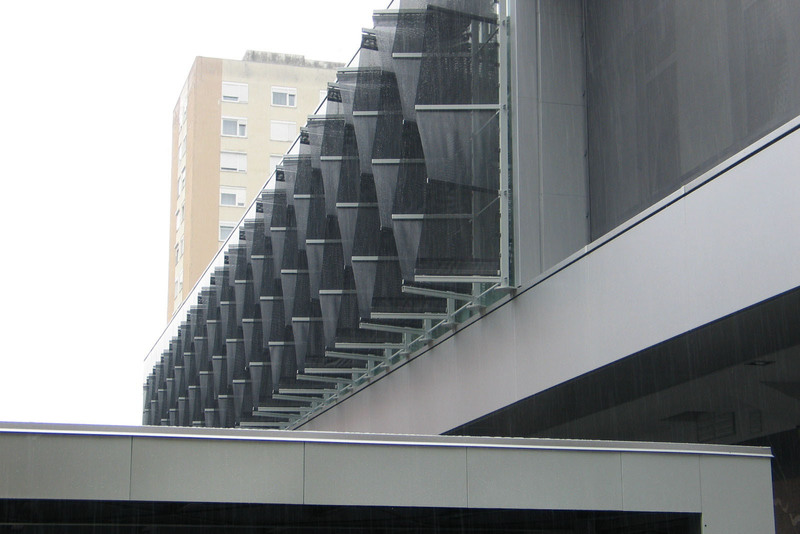 Public library in Velenje – perforated membrane façade with aluminium elements. Public library in Velenje – diverse decorative perforated membrane façade. BMW Makoma – perforated membrane façade in Novo mesto. 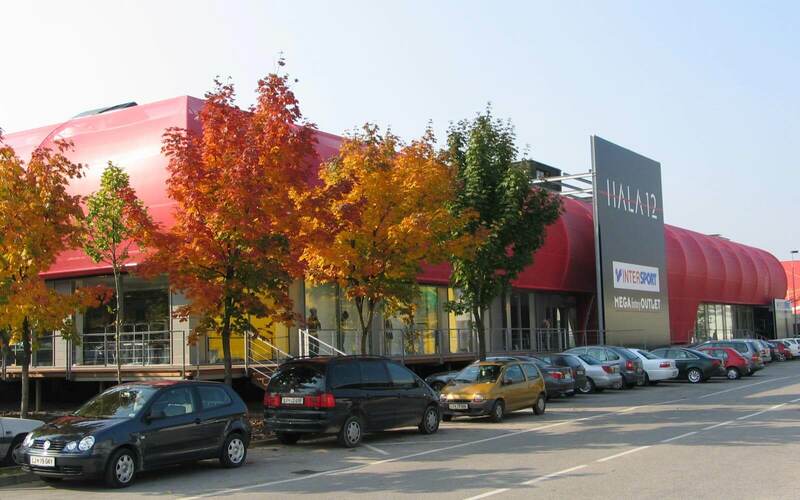 Shopping centre Klagenfurt – secondary membrane façade from perforated sheet metal in Klagenfurt, Austria. Esseker center in Osijek – perforated membrane façade on the Esseker shopping mall in Osijek, Croatia. Loging Novo mesto – decorative secondary perforated membrane façade that reduces cooling costs by almost 30%. Decorative protection of a historical building – thermomembrane roofing on a roman tollhouse in Reutte, Austria. Decorative protection of a historical building – protective membrane façade with a picture of the actual ruins behind the membrane. Overhead roofing in Terme Tuhelj – thermomembrane overhead roofing over the swimming pools in Terme Tuhelj, Croatia. Overhead roofing in Terme Tuhelj – overhead roofing over the swimming pools with translucent PVC and ETFE thermomembrane elements. Avditorij Portorož – opening thermomembrane roof (open) in Portorož. Avditorij Portorož – shell-shaped opening thermomembrane roof (closed) in Portorož. Emporium performance pavilion – mobile performance pavilion, made for fast and easy erecting and dismantling for an easy transport to a new location. Mercator Split overhead roofing – membrane overhead roofing over the entrance into the Mercator shopping centre in Split, Croatia. Mercator Osijek overhead roofing – membrane overhead roofing over the restaurant in the Mercator shopping centre in Osijek, Croatia. Hotel Radisson overhead roofing – membrane overhead roofing over the hotel entrance in Dubrovnik, Croatia. 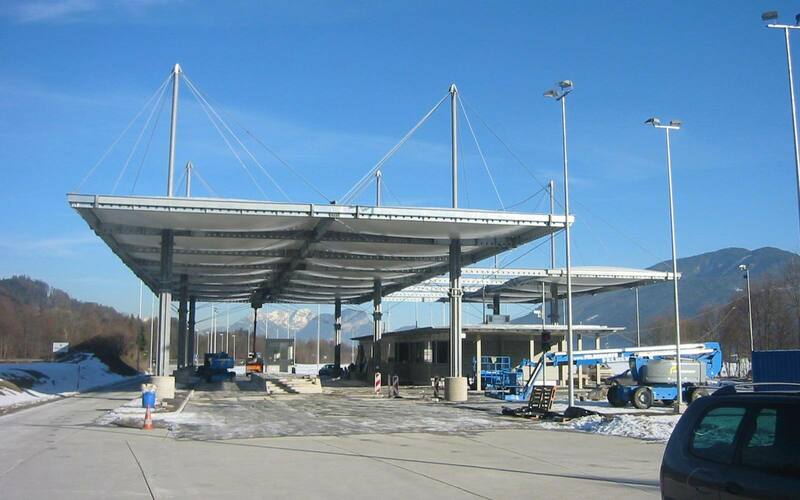 Radfeld overhead roofing – thermomembrane roofing over the station in Radfeld, Austria. Karlovac overhead roofing – membrane roofing over the rail station in Karlovac, Croatia. Bernardin overhead roofing – sail-shaped membrane roofing over the swimming pool at the hotel Bernardin in Portorož. Safety net in Bad Kleinkirchheim – carrying construction and steel wire ropes for safety nets on the ski slope in Bad Kleinkirchheim, Austria.